The Biggest soccer publication in Africa! The leader in the latest local and international soccer news — The Elite 16 Take Their Skills To The NXT LVL! The Elite 16 Take Their Skills To The NXT LVL! The Boot Camp has come to an end. All of the aspiring young footballers were first put through their paces by legends of the South African football fraternity and then trimmed down to a group of 32. Then team Lucas Radebe battled it out against Team Mark Fish, a game which proved to be a fierce encounter as the teams – consisting of both male and female footballers – fought it out for the coveted prize. Eventually Team Fish claimed the Vodacom NXT LVL title, with his charges winning scholarships to the Tuks Sports High School and a chance to turn their dreams into a reality. The 100 players who attended the Vodacom NXT LVL Boot Camp, accompanied by legends Mark Fish and Lucas Radebe, were chosen from the 1000 entries received by Vodacom. These 100 players were then faced with a variety of challenges on the field of play and were thoroughly tested by the coaches, after which the group was cut down to 32 young stars who’d faced all the trials thrown at them head-on. Despite Team Radebe’s narrow loss in the final, Kirsten Santillan - a player on the losing side - had only positive things to say about the Vodacom NXT LVL experience. Fifteen-year-old Mathuane Duwy Selotola was named the Man of the Match for Sunday’s encounter, when his team, mentored by Mark Fish, walked away with a bursary by beating Team Radebe 2–1. “It felt good to be named the Man of the Match. It wasn’t an easy game, but we believed in ourselves that we could win the game. We fought as a team until the last whistle. My dad even came to support me. He had tears in his eyes… tears of Joy. They say a man doesn’t cry, but a happy man who is proud of his kids does. I had an emotional evening. All thanks to God! The coaches always encouraged us to never give up during the match. Portia Modise always pushed me to my limit. She believes in me and I couldn’t disappoint her or myself. It wasn’t easy, as most of the Radebe team players were older than us. They had the power and energy, so we had to outthink them… play with them mentally. The coaches gave us the brains, which led us to this victory. 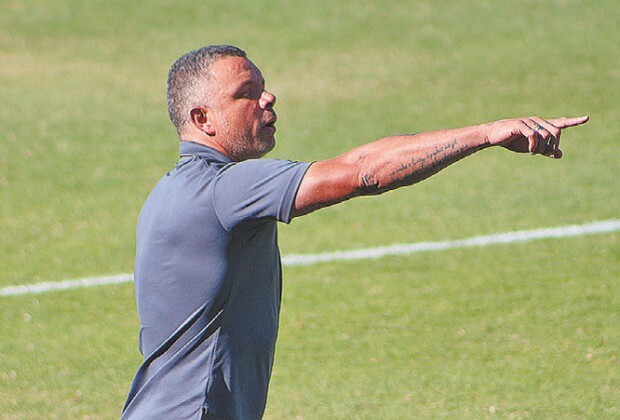 Soccer Laduma also spoke to former Bafana Bafana defender and Vodacom NXT LVL winning coach Mark Fish, who was an instrumental figure as he guided the aspiring footballers and led his 16 players to a sports bursary.